Feeling a bit dizzy anyone? Like many of you, I am greatly concerned about the last several days of executive orders and cabinet picks coming from the White House. The new administration has thrown issue after issue into the mix at a dizzying pace. I barely take it in before a brand-new issue flies out; the responses from opposition come just as rapidly, calling for resistance. I’m a person of measured, careful, intentional thought (read: slow) about how to respond, so at this speed, my brain has pretty much stalled out. And actually, that is what I worry about most. Are we being kept off balance and distracted purposefully? Minds greater than mine are asking that same question so maybe we can clear the fog in the near future. In the midst of this world of turmoil, in Sunday’s Gospel text, Jesus says “You are the salt of the earth.” “You are the light of the world.” Note that he doesn’t say you will be if you do this or that…. He says you are. Hmmm …. I are? Are you sure? The only way I can conceive of it is by taking a page from Luther’s Small Catechism: I cannot by my own understanding or strength be salt or light but instead the Holy Spirit has called, enlightened, sanctified and kept me as salt and light even as the Holy Spirit has called, gathered, enlightened, sanctified the whole church to be salt and light. Ah yes, the “are” comes from the Spirit of God. Salt and Light. God’s kingdom active in the world. Salt adds flavor, helps preserve; light brings safety and warmth, and shows the way. Here are a couple of thoughts on being salt and light. In his book Speaking Christian, Marcus Borg says that we less “noisy” Christians need to speak out at all levels. I’ve seen that happening since November; even right here in Gloria Dei. OK. That is salt. That is light. Sal y Luz. Several years ago, Gloria Dei had a group supporting peace efforts in Colombia. Its name was Salt and Light. The Evangelical Lutheran Church in America (ELCA) has statements on social issues that were developed from local and national conversations among members. The statements provide perspectives from Scripture and from the "best knowledge" available in the secular realm on a variety of issues…. Like immigration, refugees, healthcare, hunger, economics, the environment, gender-based violence, peace. From those statements, they also have a ministry of advocacy which can guide our salty contacts with those in power, and shed light on ways to be heard. How have you been the salt of the earth? the light of the world? so let your light so shine so that they might know some kindness again. We all need help to feel fine (let’s have some wine!). 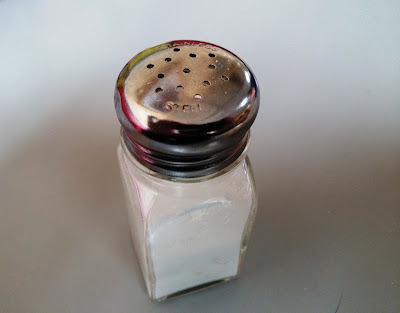 I always fail if I say, "Today I will be salt by doing this/that..." However, I find sometimes that I can look backwards in my life and find, "Wow, that was a really salty thing I did. I wonder how that happened..." Of course, the answer is always God.